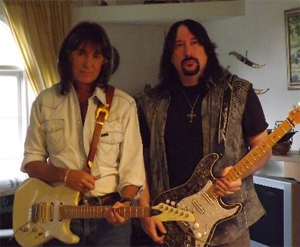 ANGEL guitarist Punky Meadows has announced that he has a brand new solo album in the works, with shows and a possible tour to follow. Punky has not released any music in 35 years, since the break up of ANGEL in 1980, and he says he has found a new passion and is really excited about the new project. Punky recently teamed up with friend Danny Anniello (aka THE FARROW, LORDS OF MERCY) and have been collaborating and writing together for the past months and will start recording at the end of May. You can hear a brand new Interview with Punky and Danny this Sunday, April 5th from 8 - 10 PM on the Electric Ballroom program with host Keith Roth on 95.9 THE WRAT. You can also go to the website HERE and click on top right “Listen Live“ to hear worldwide.